French expert Stéphane Garganigo, also known as Barb, has released a sound library for the Korg Kronos, Kronos X and Kronos 2015 workstations. Korg is showcasing on its booth at NAMM 2015 the new Kronos we talked to you about last November. The new edition of the Kronos workstation sports a new look, 9 sound engines, a touch screen and new sounds. 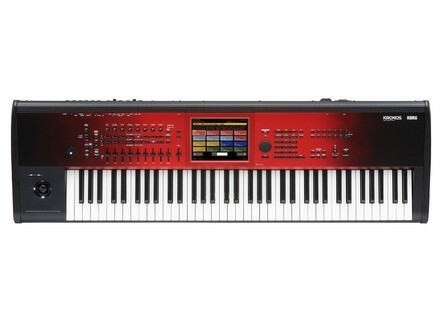 Korg USA announces new, lower prices on original Kronos Music workstation models. Korg has released System Version 1.5, a free update for their flagship Kronos Music Workstation. Korg announces that its Kronos Music Workstation received an award at the 12th annual Musikmesse International Press Award (MIPA) Ceremony, held April 7, 2011, in Frankfurt, Germany. Korg introduces the Kronos Music Workstation. The first details and pictures of the new Korg Kronos were leaked from the NAMM floors.